Did you know that transportation jobs = STEM jobs? It takes a lot of careful planning and expertise in the fields of science, technology, engineering, and math (STEM) to figure out how to best move people and goods from one place to another, to build safe bridges and roadways, and to provide communities with a high-performing multimodal transportation system. We often talk about STEM in relation to preparing the next generation for the 21st century workforce. But the truth is that STEM jobs — and particularly those in the transportation industry — draw on some of the most basic engineering and math principles. From Legos to Rubik's Cubes, these classic toys of our youth are the building blocks to knowledge. And it's never too early to foster an interest in STEM. In fact, as a child, I loved to play with erector sets — a toy that launched over 100 years ago! — taking great care to create my own miniature buildings and vehicles. In college, I played Sim City right when computers were really coming onto the scene. It was this natural affinity for engineering, math, and science that lead me down a career path that included working at the Environmental Protection Agency, and later, focusing on urban planning and transportation. I enjoy using my love for math and science to make our communities safer and better. As the Secretary of Transportation, I'm proud to join Governor Wolf and Education Secretary Rivera this summer in highlighting the importance of STEM education, as part of the #SummerOfSTEM initiative. We have a shared interest in expanding access to computer science and STEM education for students across Pennsylvania. This year, Governor Wolf introduced PAsmart, a $30 million investment to develop and expand computer science and STEM in K-12 education, to prepare and train educators to teach in computer science, STEM, and to offer job training for adults in computer science. Pennsylvania is a national leader in STEM, but we need more people with these skills and knowledge to enter the field. Research suggests that over the next 10 years, 71 percent of new jobs will require computer science skills. 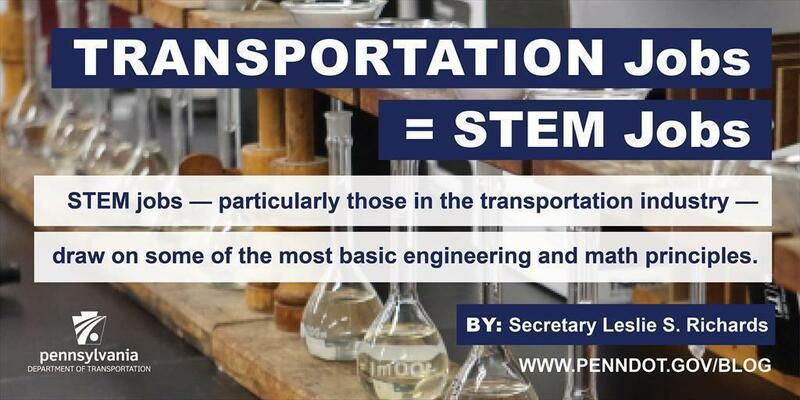 At PennDOT, we've been particularly interested in encouraging girls, who we know are often underrepresented in STEM, to learn more about the possibilities associated with transportation careers. Our staff takes time to meet with local Girl Scouts chapters, to present at schools and libraries, and lead groups on tours of the PennDOT Materials Testing Lab. Whether it's highway design, traffic, planning, structures, land development, construction, materials, environment, water resources, or transit — it's important to demonstrate to students how everyone is affected by science and engineering. At the end of the day, it's my hope that these efforts are sparking the fuse for future generations of STEM enthusiasts like myself.